I passed so many times In front of the Luma hotel, barely noticing the restaurant located on the first floor. Little I knew that this place, Ortzi, would be a fantastic experience, service and food wise. With its beautiful and warm decor, and its open kitchen where unfortunately Chef Jose Garces was absent, it does not have an hotel feel. Then then brought us some Majorca bread that was so good! As an amuse, they bought us some delicious paella balls, similar to rice balls but with a seafood paella in it. I was curious to try their pulpo or braised octopus. 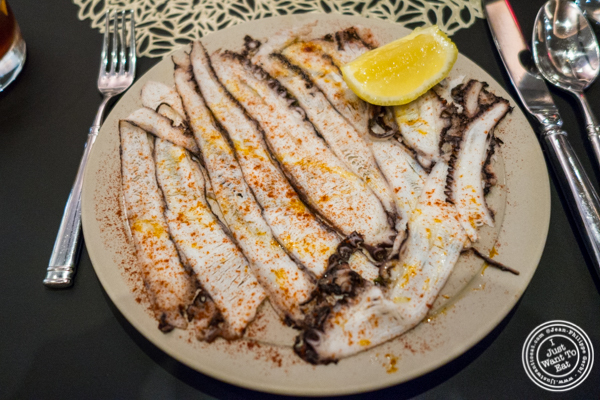 The presentation surprised me: the octopus was cut in thin slices, like a carpaccio. It was very good, but I admit that I prefer it served uncut so you really get more texture. Jodi got their salad with a blue cheese sauce that was composed of lettuce, lemon confit and brioche croutons. Good and not overdressed. I then went for their lamb chops that were fantastic, perfectly cooked medium. We also shared some sides. 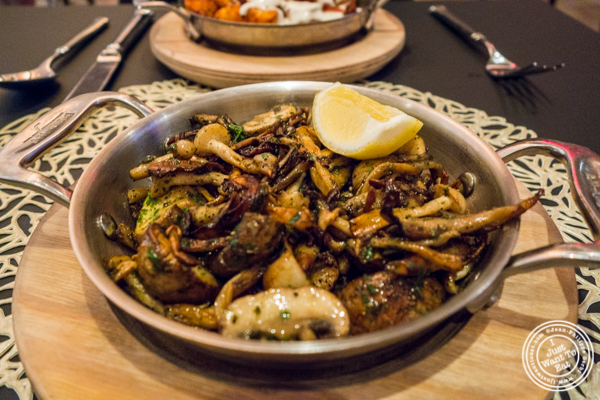 The first one was the setas or seasonal wild mushrooms that had a nice kick. And the patatas asturianas or crispy potatoes that were definitely...crispy. A quite good side served with tomato and La Peral, a cheese from Spain. Last was dessert. We opted for the Copa Caramel, that was made with a milk chocolate cream, caramel espuma, Pedro Ximenez, Orange and sea salt. This was a fantastic dessert, very creamy and quite decadent. We had a great time at Ortzi and the food was amazing. I definitely recommend this place!